Aggregate Industries’ inaugural Concrete Rugby festival was held last week between three Leicestershire schools. The round-robin tournament took place as part of a six week programme organised by Aggregate Industries and Leicester Tigers Foundation Trust. 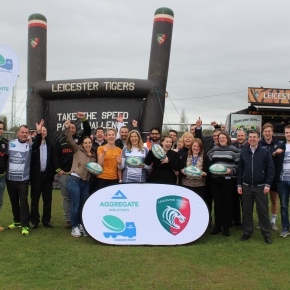 Hosted at Aggregate Industries’ Bardon Hill HQ, the event featured surprise visits from Leicester Tigers stars Logovi’i Mulipola and Marcos Ayerza. The Tigers players presented the pupils with certificates for taking part at the end of the event and praised pupils on their performances. Concrete Rugby is a six week programme where coaches from Leicester Tigers introduce rugby to pupils in school years 7-9 across the county. Coaches teach a range of skills including handling, tackling and gameplay, as well as discussing the importance of safety, exercise and well-being. Further activities include taking part in the ‘speed pass challenge’, ‘Tigers tackle bag’ and the ‘ultimate big boot challenge’ – the latter of which taking place during half-time at a Leicester Tigers home game. Organisers are aiming to introduce the Concrete Rugby programme to over 1,000 pupils over the course of the season. Chris Hudson, Managing Director, Asphalt & Readymix Concrete at Aggregate Industries, added: “It was great to host the first Concrete Rugby festival at our head office in Bardon Hill. The Concrete Rugby initiative is all about giving young people the life skills needed to lead a healthy and active lifestyle.